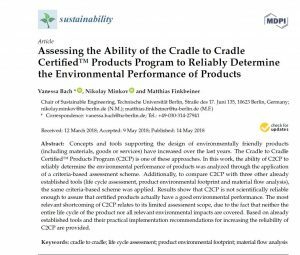 Nikolay Minkov, Vanessa Bach and Matthias Finkbeiner from the TU Berlin have published a scientific paper in the journal Sustainability of the publisher MDPI (Multidisciplinary Digital Publishing Institute) assessing the ability of the Cradle to Cradle Certified™ Products Program (C2CP) to Reliably Determine the Environmental Performance of Products. I n this work, the ability of C2CP to reliably determine the environmental performance of products was analyzed through the application of a criteria-based assessment scheme. Additionally, to compare C2CP with three other already established tools (life cycle assessment, product environmental footprint and material flow analysis), the same criteria-based scheme was applied. Results show that C2CP is not scientifically reliable enough to assure that certified products actually have a good environmental performance. The article is published open access and is available for .free download. In March 2018 , another scientific paper to characterizing the Cradle to Cradle Certified ™ Products Program was published by them in the same journal.